UPDATE: Due to the river levels and flooding we have to cancel today’s event in effort to keep everyone safe. Stay tuned for updates regarding a reschedule date. New River Adventure, Inc. partnering with the Earth Day Network presents their 1st Annual Earth Day Festival on Saturday, April 20, 2019 at Shelter #3 in Bisset Park. 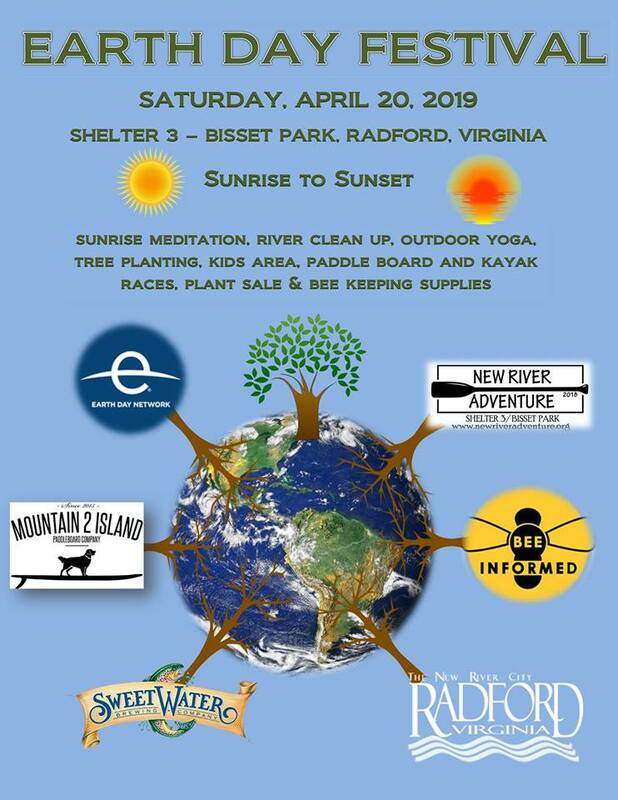 The day will start with a sunrise meditation and end with a sunset views over the historic New River in Radford, VA. Activities include plant sale, outdoor yoga, paddleboard and kayak races, tree planting, bee Keeping seminar, vendors, food, kids area activities sponsored by Rad Roots. Enjoy live music starting at 2:00 pm featuring Eric Gress, Jared Stout and The Generations. Beverage stations will be available sponsored by SweetWater Brewing Company. To view the event flyer, visit: https://i.imgur.com/X4NZ1oy.jpg. For more information, visit: https://newriveradventure.org/ or https://www.facebook.com/newriveradventure/ or https://www.facebook.com/events/596672014125407/ or call 540-838-9669.